Petra is known for the Treasury a huge carving facade on the side of a mountain. 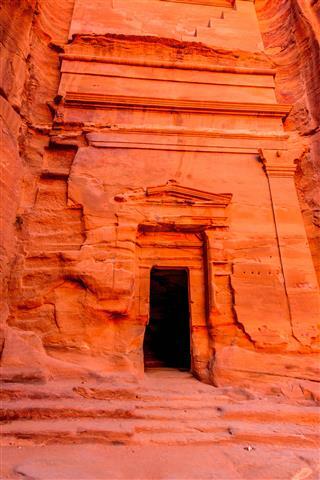 It was inhabited by the Nabateans, see how their power and influence was imposed here by the structures that they built. 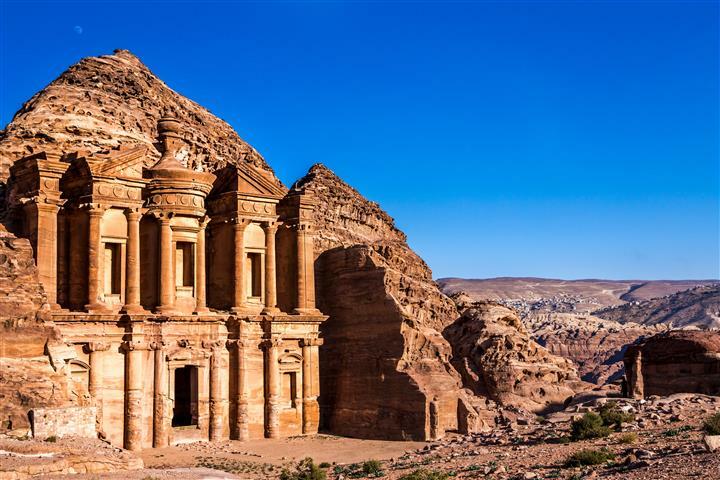 The rose stone palaces are impressive, and there are over 800 structures to visit in Petra. 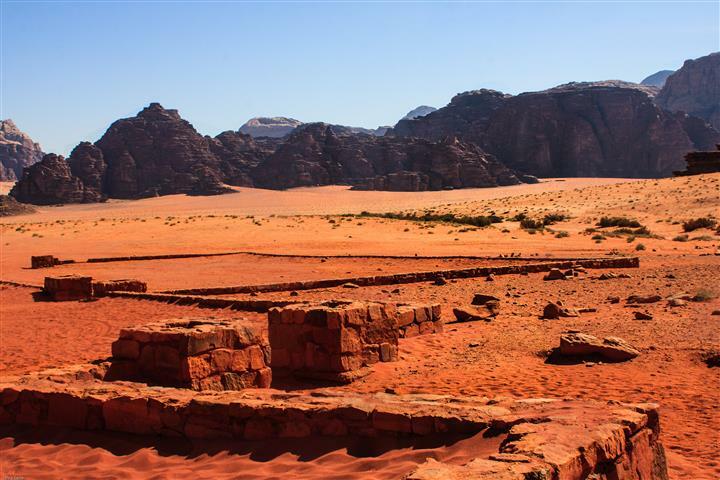 Wadi Rum is a valley cut into the sandstone and granite rock in Southwest Jordan. It has been inhabited by many human civilizations since prehistoric times and is dotted with massive rock formations. 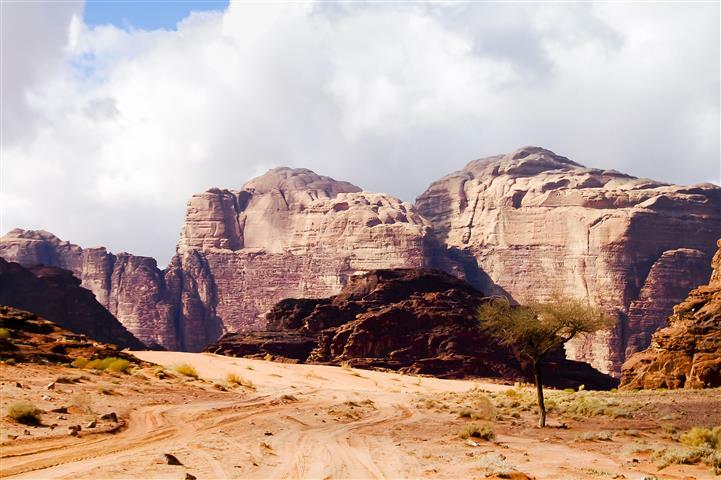 In Wadi Rum the sandstone are like sculptures jutting out of the sand. The Bedouins have resided here for hundreds of years. They have 2 schools, one for girls, and one for boys. The Dead Sea is famous for being the lowest point on Earth, 400 meters below sea level. The Jordan river feeds into it but without an outlet. 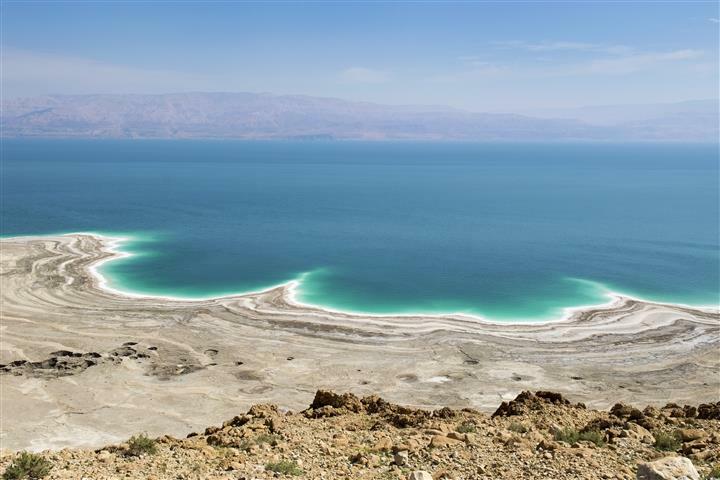 No plant or animal life can survive in the Dead Sea because of the high salt content. The Dead Sea has been recognized for its curative properties for thousands of years. King David used to come here for sabbaticals. You will be picked up from the airport and transported to your hotel in Petra. This is around a 3 hr. drive.There are no activities planned on this day.Overnight in a hotel in Petra. You will need to coordinate with your driver to leave for the airport from the Dead Sea no later than 3 hours prior to your flight departure time. This tour can also be made from Eilat. Transportation throughout the trip using a deluxe air-conditioned private car with an English speaking driver (sedan or van or a small bus depending on your group size). We recommend that you have cash money available for fees and tips. As you exit immigration and baggage claim, your driver will be waiting for you; holding a sign with your name. You will be on the move a good deal, so pack as lightly as possible (try to stay around 10 kg /22lb). It is in your own interest as you are expected to carry your own luggage. So to get maximum comfort, pack small and light! You will also need a day pack/bag to carry water and a camera. … etc., for day walks and day trips. Temperatures in Jordan can be hot and with little rain. This can become extreme towards and during the summer months of May to August. In the months of November to March it can be very cool at night particularly in the desert where night temperatures can drop to 5C or less. Even in the hot months out in the desert it can get cold at night. A light water and windproof jacket is useful and a hat essential. From mid-November to late February a sleeping bag is essential for your nights in the desert. At other times a sleeping sheet will suffice.